After Overcoming Early Obstacles, Yellen Assumes Fed's Top Job The world of central banking is largely a man's world. But Janet Yellen, the Federal Reserve's new leader, has been undeterred by such barriers since she was in high school in Brooklyn. Now global financial markets will be watching her every move. Janet Yellen smiles as President Obama announces her nomination for Federal Reserve chairwoman on Oct. 9. 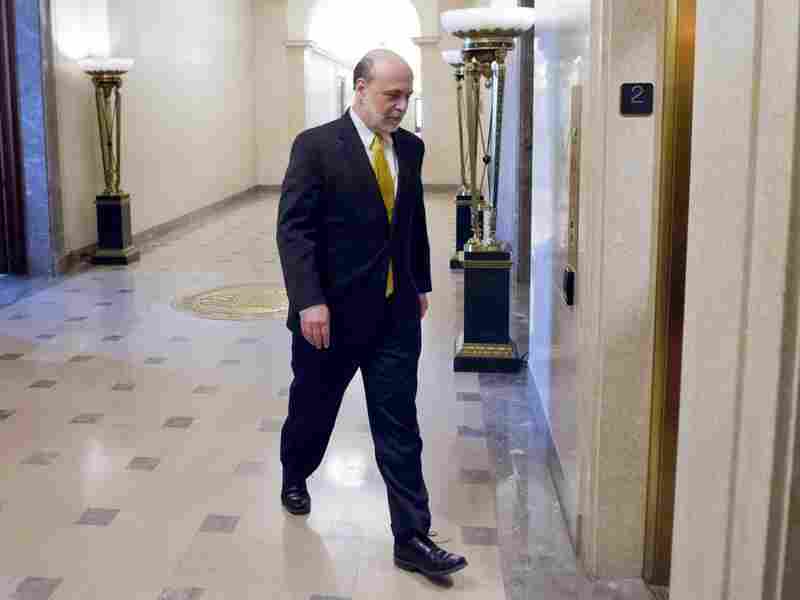 Ben Bernanke hands over the reins at the Federal Reserve to Janet Yellen on Friday. The Fed's vice chairwoman will be the first female ever to lead the nation's central bank. It's a position many view as the second most powerful in the country. The world of central banking is largely a man's world. But Yellen has been undeterred by such barriers since she was in high school in Brooklyn. Charlie Saydah, a former classmate, says she was probably the smartest kid in the class. Yellen was "clearly smart, and she was smart among a lot of smart kids," he says. But she couldn't attend Stuyvesant, the competitive public school for Brooklyn's best and brightest. "She didn't go because, you know, she was a girl," Saydah says. And back then, in the early 1960s, Stuyvesant only admitted boys. Saydah, a retired journalist, said that meant girls dominated the regular public schools, like Fort Hamilton High in the Bay Ridge section of Brooklyn. Saydah says he graduated 26th out of that class. "Everyone ahead of me was a girl," he says. "I would have expected her to not only succeed but excel in anything she did," Saydah says. Yellen studied economics at Brown University and got her doctorate at Yale. She was deeply influenced by professor James Tobin, who had lived through the Depression and impressed upon her the toll inflicted by unemployment and the government's responsibility to fight it. Yellen voiced that concern during a speech before the AFL-CIO about a year ago. "These are not just statistics to me. We know that long-term unemployment is devastating to workers and their families," she said. Yellen certainly knows her way around the Fed. After teaching at Harvard she went to the Fed as a staff economist in 1977. She met her husband, Nobel Prize-winning economist George Akerlof, in the Fed cafeteria. After another stint in academia at the University of California, Berkeley, she was named a Federal Reserve Board governor by President Bill Clinton. Brookings economist Alice Rivlin was a vice chairwoman of the Fed during that period and recounts Yellen's career: "She was an extraordinarily effective board member and she's been chairman of the Council of Economic Advisers. She's been the president of the San Francisco Fed, and for the last several years she's been vice chair at the Fed." Another former Fed vice chairman, Alan Blinder, now an economist at Princeton, says even Ben Bernanke didn't have better a resume than Yellen. And, Blinder says, she understood the threat of the housing bust early on. He says Yellen saw "much earlier than most — I think even a bit earlier than Ben Bernanke — that what was happening in the mortgage market was posing a grave peril to the economy." But there are those who are concerned that Yellen is a dove on inflation — that she's willing to tolerate more inflation to get the unemployment rate down. "I think it is a fair assessment that she's perhaps even more dovish than Ben Bernanke, more concerned about unemployment, more willing to take some risks on inflation," Harvard economist Ken Rogoff says. Rogoff thinks that's the right position under the current circumstances when inflation is historically low and unemployment is high. But Laurence Meyer, another former Fed governor, says he witnessed Yellen's commitment to keeping inflation low when they were both Fed governors in the mid-1990s under Chairman Alan Greenspan. Meyer says both he and Yellen were concerned that with the economy strong and the unemployment rate low, there was a growing threat of inflation and that the Fed should raise interest rates to head it off. "We went to the chairman with that concern," Meyer says. "Of course, I'll say that the response was, 'Nice to see you. Have a good day.' But the important point was that at that point, like myself, Janet was concerned about inflation and perhaps more concerned than most other members" on the policy-setting Federal Open Market Committee. Right now, with unemployment still high and U.S. growth still slower than desired, Yellen is likely to continue to keep interest rates low for some time. She suggested that at her confirmation hearing late last year. Ben Bernanke leaves his office in Washington, D.C., Friday on his last day as chairman of the Federal Reserve Board. "We've made good progress, but we have further to go to regain the ground lost in the [financial] crisis and the recession," she said. Given that Yellen worked with Bernanke to develop the Fed's current policies, it's widely expected the transition will be smooth. As the Fed vice chairwoman, Yellen takes over operationally when Bernanke leaves at the close of business Friday. 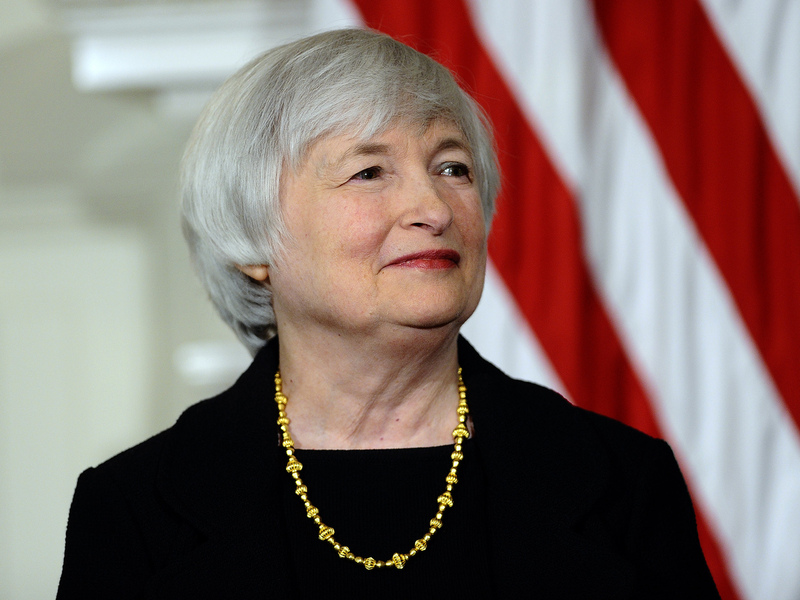 She will be officially sworn in as the new Fed leader Monday morning.